Many brides have dreamed of that destination wedding on the beaches of Jamaica, the Castles of Europe, the Cinderella Castle in Disneyworld or some other exotic location only to find it just wasn't practical or economical. Or, they find many of the guests they really want with them on their special day will not be able to attend. Destination brides: let Louisiana Castle be the place where your dreams can become a reality! Louisiana Castle is the perfect option to have the wedding of their dreams without the inconvenience and expense of other locations. Even brides within driving distance of the Louisiana Castle say that a wedding at The Castle seems like a destination wedding without the expense and inconvenience of flying to a distant location. For our more distant brides, where flying is necessary, being near New Orleans is very convenient. Everyone knows what a fun city New Orleans is. There are several reasons why many brides choose the Louisiana Castle for their destination wedding. 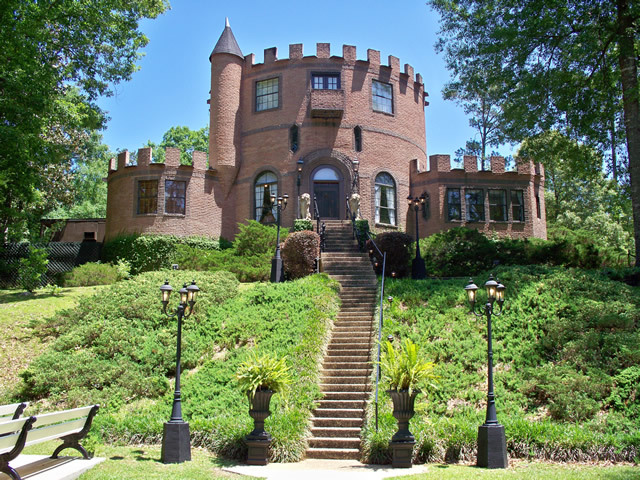 The Louisiana Castle is a replica of an English Norman Keep Castle located on 10 acres just north of New Orleans and outdoor ceremonies are our specialty. The breathtaking outdoor ceremony site located on our pond-side stage in front of the Castle is so beautiful and unique that brides from throughout the country know that this is where they want their wedding as soon as they see it. And... Louisiana Castle can accommodate up to 350 guests at any day or time! The interior of the Castle is as unique as its exterior. The 1200 square foot Juliet Suite is located on the top floor of the Castle with a balcony that overlooks the ceremony site. The Juliet Suite is provided for the bride and her bridesmaids to prepare for the wedding and, more importantly, for the bride and groom to spend their wedding night. When the bride and groom spend the wedding night, they get the use of the entire Castle and its grounds for the evening. There is even an outside deck with a jacuzzi tub. Spending the wedding night at the Castle is the perfect ending to the perfect day. The ability to have the ceremony, reception and wedding night in one place appeals to destination brides because of the difficulty of planning a wedding long distance. Destination brides also appreciate the convenience of our complete packages. The ceremony site and reception area comes fully decorated. In the ballroom there are chair covers with bows and floral centerpieces that adorn all the tables. The packages include catering, a wedding cake and a groom’s cake. A DJ for both the ceremony and the reception is included. The Castle staff can customize a package if the bride wants something special. We will help the bride in any way we can. Louisiana Castle will assist destination brides with hotels, tour buses, restaurants and other details. 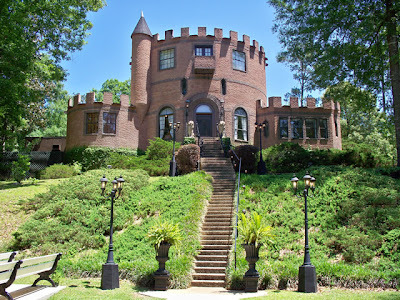 Although Louisiana Castle provides a coordinator for the ceremony and reception, there are many needs of a destination bride leading up to your big day to include coordinating transportation, providing local information regarding accommodations and restaurants while your guests are in town for your big event, recommending and scheduling showings/fittings for Brides and any other detail for your perfect day. Melissa Amato Events strives for perfection and achieves excellence with every event that is planned. Contact Melissa Amato Events today melissa@melissaamatoevents.com for more information. For an additional fee, our decorator, Steven Thomas of “Accents in Color” can assist our brides with florals, colors and decor. Please contact him at accentsincolor@gmail.com.